The property benefits from versatile accommodation including a ground floor bedroom and en-suite shower room which would lend itself to use as a B&B. Viewing is recommended. The village is closeby with a small shop. The School bus has a collection point not far from the house. 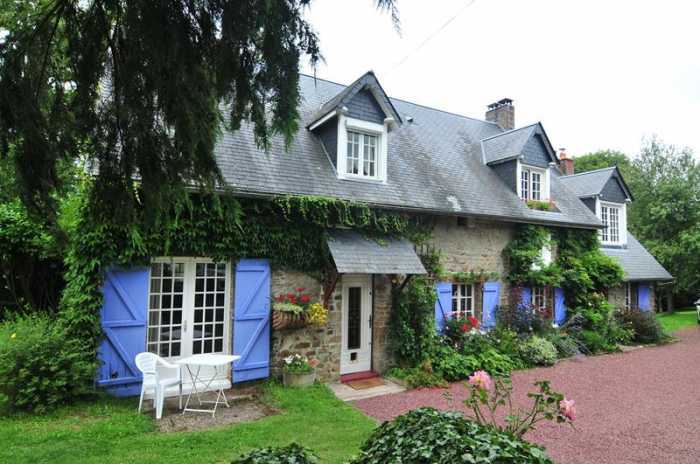 The market towns of Vassy and Condé sur Noireau are a 10 minute drive and have all amenities. Ideally situated, the property is situated close to several large rambling routes, which trail through the wonderfully unspoilt Normandy countryside. At just over an hour from the coast, the property is within easy reach of the Normandy landing beaches, Mont St Michel and many other attractions that Normandy has to offer. The house is situated in the Suisse Normande countryside. A beautiful area of rivers, valleys, woodland , spotted Normandy Cows & cider orchards, offering a large range of activities for the outdoors including walking, cycling, fishing, canoeing. Condé sur Noireau, less than 10 minute drive has a bustling 'foodie' market on Thursday mornings and offers plenty of places to eat and drink, as well as a good supermarket, boulangeries, tabac etc. Mont Cerisy Belle Etoile has a ruined Chateau, bombed in the Second World War, a great assault course for children and adults too, and a beautiful rhododendron walk. Flers, a twenty-minute drive south, is a bustling town with good shopping facilities. The UNESCO heritage site of Mont Saint Michel is a 1 hour 40 minute drive. The Normandy landing beaches and the coast are about an hour's drive from the property. There are plenty of options for travel to the property with Cross Channel ferries: Portsmouth - Ouistreham (Brittany Ferries) 1-hour drive, Portsmouth - Le Havre (Brittany Ferries) 1-hour 45-minutes, Portsmouth - Cherbourg (Brittany Ferries) 1-hour 45-minutes, Dover - Calais (various operators) 4-hours. The Euro tunnel: Folkestone - Calais 4-hours. Flights from Stansted - Dinard (Ryan Air) 1-hour 50-minutes. Entrance Hall Partly glazed door to front elevation. Tiled floor. Stairs to first floor. Convector heater. Telephone socket. Under stairs storage area with space and plumbing for washing machine. Cloakroom Window to rear elevation. WC. Hand basin. Tiled floor. En-Suite Shower Room 2.81 x 1.19m Window to rear elevation. Tiled floor and walls. Large shower. WC. Convector heater. Vanity unit. Extractor. Lounge/Dining Room 5.29 x 4.97m Window to rear and 2 windows to front elevations. Tiled floor. 2 convector heaters. Fireplace with inset wood-burner. Exposed beams. Kitchen/Breakfast Room 5.09 x 3.11m Tiled floor. Partly glazed “stable” door and window to front elevation. Built-in shelves. Fireplace with wood-burner. Space for free standing fridge/freezer. Range of matching base and wall units. Tiled worktops and splash-backs. Sinks with mixer tap. Space and plumbing for dishwasher. Built-in electric oven and 4 ring gas hob with extractor over. Cupboard housing electrics and hot water cylinder. Exposed beams. Inset spotlights. Landing Velux window to rear elevation. Hatch to loft. Wood flooring. Study/Bedroom 2 2.82 x 2.16m Window to front elevation. Convector heater. En-Suite Shower Room Tiled walls and floor. Shower. WC. Hand basin. Convector heater. Inset spotlights. En-Suite Bathroom 3.43 x 1.86m Bath. Wood flooring. Tiled walls. Vanity unit. WC. Large shower. Heated towel rail. Inset spotlights. Bedroom 5/Sitting Room 4.35 x 2.70m Partly glazed door to external stairs. Window to front elevation. Wood flooring. Exposed “A” frame. Convector heater. Double wrought iron gates lead to gravel parking and turning area. Orchard with plum, apple, soft fruits, hazelnuts etc. Mature trees and hedges. Detached Block built garden shed and attached open fronted log store. Attached to the rear of the house is a Garage 6.00 x 3.03m Constructed of block under a Fibro cement roof. Up and over door. Power and light. Concrete floor. Garden area laid to lawn with mature trees and shrubs. Gazebo with Wisteria and decking. Mains water, telephone and electricity are connected. Drainage to an all water septic tank. Electric heating and woodburner. Broadband internet connection.